If I’m out with my kids on a hot summer morning, chances are you can find us at Ricky Guerrero Park. Hidden back on a quiet cul de sac just north of Oltorf, this park is full of open space, a small playground and, most importantly, what I deem the best splash pad in Austin. In order to earn a spot on my rotation of favorite summer spots, there must be an easy escape from the heat. 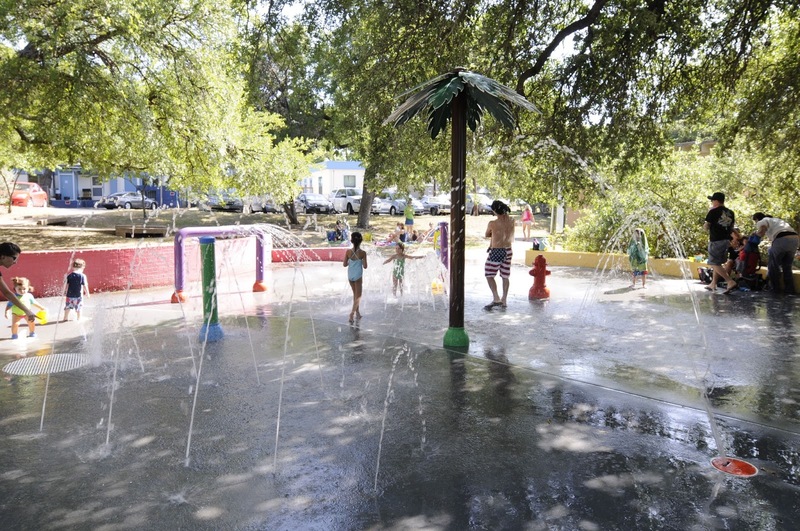 Ricky Guerrero splash pad sits under a canopy of shade trees that keep almost all of the water fun out of the direct sunlight. Parents can sit comfortably on the brick wall that surrounds most of the play area or bring chairs to set on the grass under the large tree right outside the splash pad. The shady splash pad is a popular place for birthday parties and play-group meetups, making it sometimes a bit crowded in the early morning and afternoon. In terms of actual water fun, Ricky Guerrero scores high there for both of my children. There seem to be more water features at this splash pad than at many of the others, providing a good variety of ways to play even as the area inevitably fills up with young children. The fire hydrant, showering palm tree and circle of water jets are favorites for my kids and there are water features of all sizes, from barely a trickle to high spouting sprinklers that form tunnels for kids to race through. The water automatically shuts off every 15 minutes and the children race over to push the tower at the back that restarts the flow of water. Just outside of the water play area is a small playground with two swings, a canon and a small climbing structure. The shade from the park doesn’t extend much over this area, so cooling off in the water before or after is usually necessary. There is also a dry creek that runs behind the splash pad, a fun place for older kids to explore. Stone stairs lead down to the large creek area and then a nice open spot to explore. There’s usually not much water to see, but the few puddles that sometimes sprout up after a good rain do contain tadpoles or minnows that kids love to examine. Ricky Guerrero is a perfect quick escape from the Texas heat.